This amazing building is made up of interlocking timber sections shaped entirely by robots. The building 17m in height and 245 square meter in area, only needed 12 cubic meters of timber to build. 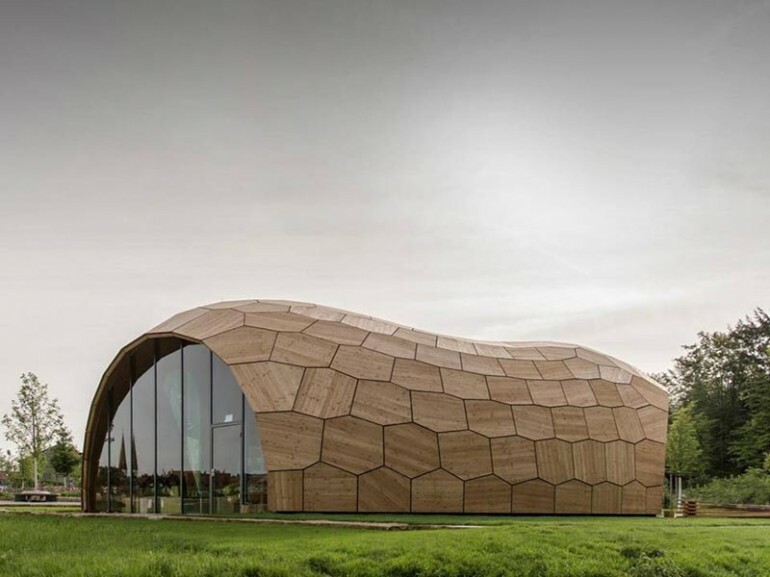 The building of Landesgartenschau is based on the biological plate structures found on nature. Researchers from the University of Stuttgart have created the world’s first building in Stuttgart which is entirely made up of components fabricated by robots. The building has been named as Landesgartenschau Exhibition Hall. 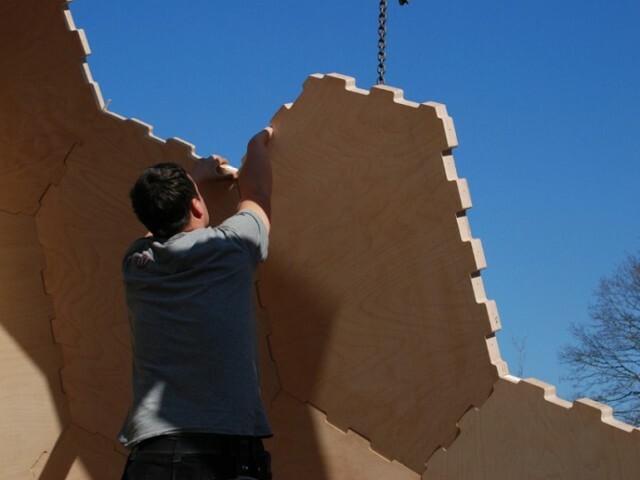 About 240 robot-fabricated beech plywood segments are joined together. The building is 17m in height with a 245 square meter structure. It only required 12 cubic meters of timber to build. The building looks very much like a large peanut. 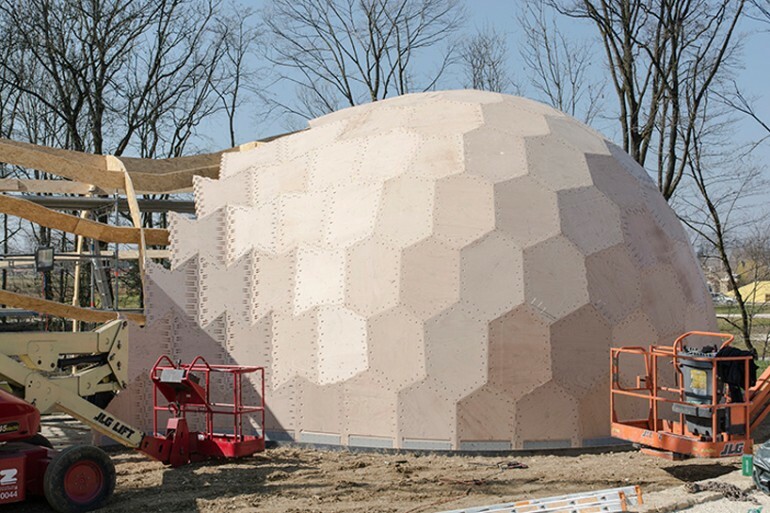 The plywood panels used are 50mm thick which are interlocked using 7600 finger joints that require no extra support. In fact, there are other buildings in the world made with the help of robots and computerized milling machines, but they still need trus roofs and stud frames. However, the Landesgartenschau is totally different from such traditional robot made structures as it is based upon how the structures in natures are made using smaller componenets, for example, biological plate cells. The idea was taken from the sea Urchin’s skeleton that is made of interlocked calcium carbonate plates. Researchers from University of Stuttgart have made a home with the help of robots. The building is made from interlocking of panels similar to the finger-joint. The hall is made by the joint venture of three institutes; Institute of Computational Design, Institute of Building Structures and Structural Design and Institute of Engineering Geodesy, all from University of Stuttgart. The material used in the building is comparatively less because of sustainable construction techniques. The building is made water proof. Thanks to the robots who gave shape to the wooden panels, the panels were made in just three weeks and the whole structure of the building was made in four more weeks. First of all, the shape of every panel is determined with the help of CAD programming followed by cutting of the panels. The accuracy of the building is claimed to be 0.03 inches. The amazing precision is a basic requirement for joint-finger structure. 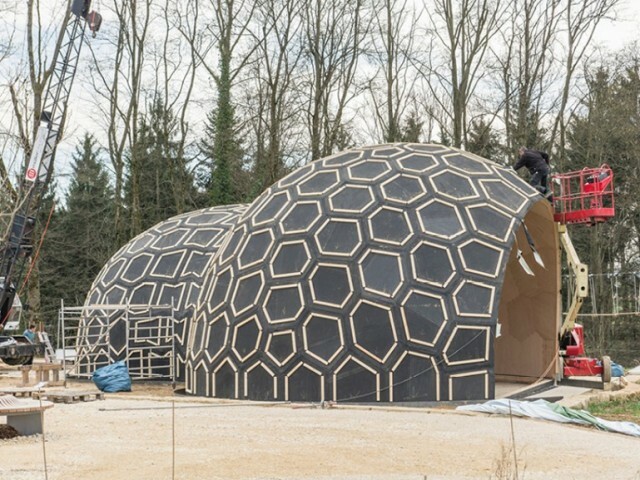 Partial support for the project was from Mullerblaustien Holzbau GmbH, a timber manufacturing company.